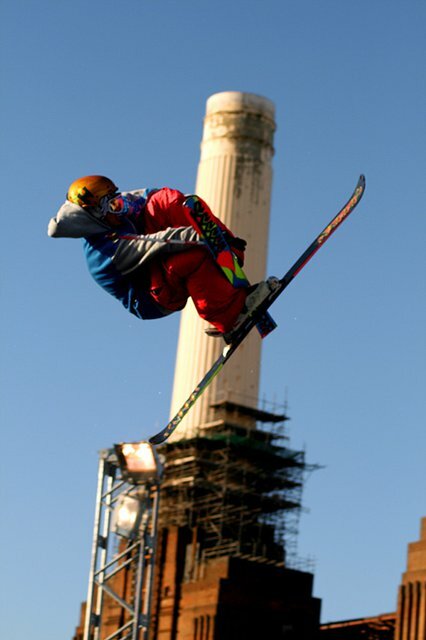 Welcome to London, where before this weekend the closest we got to stylish moves on snow was in 1963 when London had almost 12 inches of pow and people towed skiers behind their cars for fun. 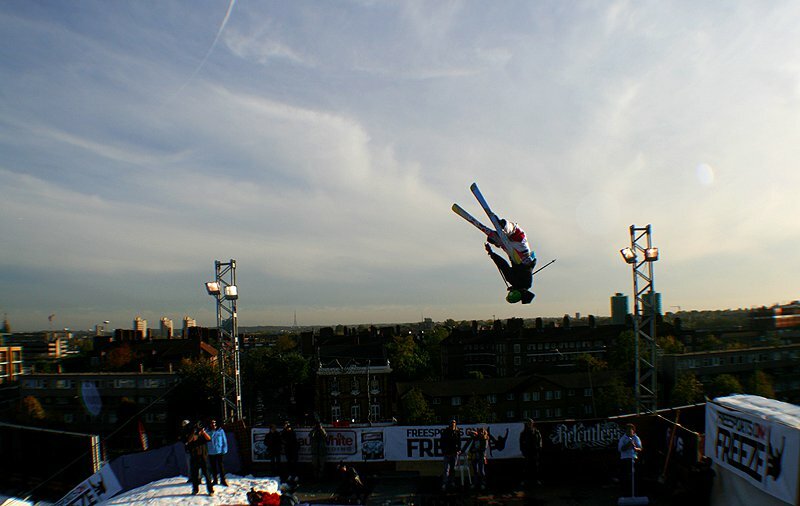 Freesports on 4; London Freeze, kicked off on Thursday, October 23rd and from the gathering crowds outside the gates of the Freeze pointing at the kicker in awe and wonder, it was obvious that London has never seen anything like this before. 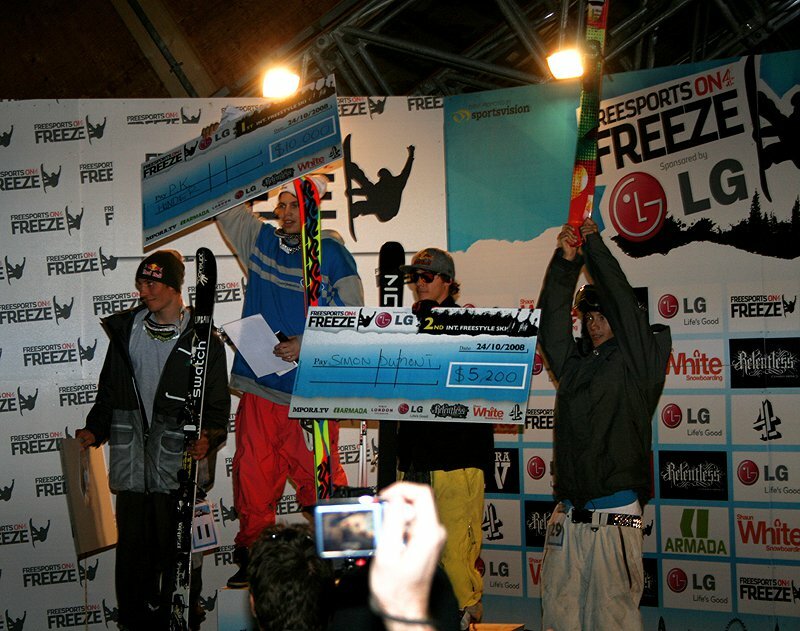 I came to the Freeze straight from the London Metro Show which is one of the biggest indoor ski shows in the world, where there was a smaller ski jump which the British riders along with Henrik Harlaut were hitting to demonstrate British skiers&rsquo; love affair with &lsquo;Snowflex,&rsquo; the fake surface that we over here in Britain use instead of snow. 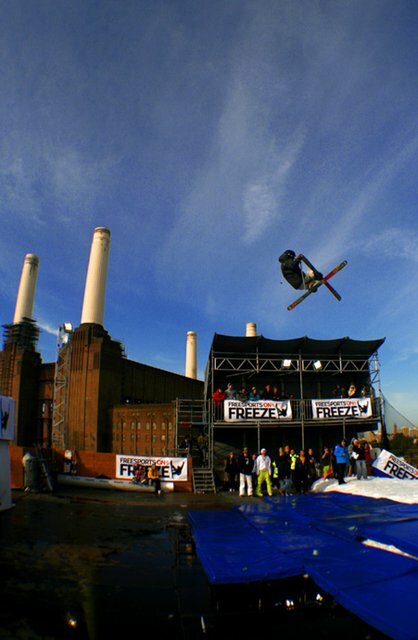 But here in Battersea, on last years Freestyle.ch setup, in the parking lot of the iconic Battersea power station, is the largest outdoor jump ever seen in England and some 500 tonnes of snow that was needed to sustain it. 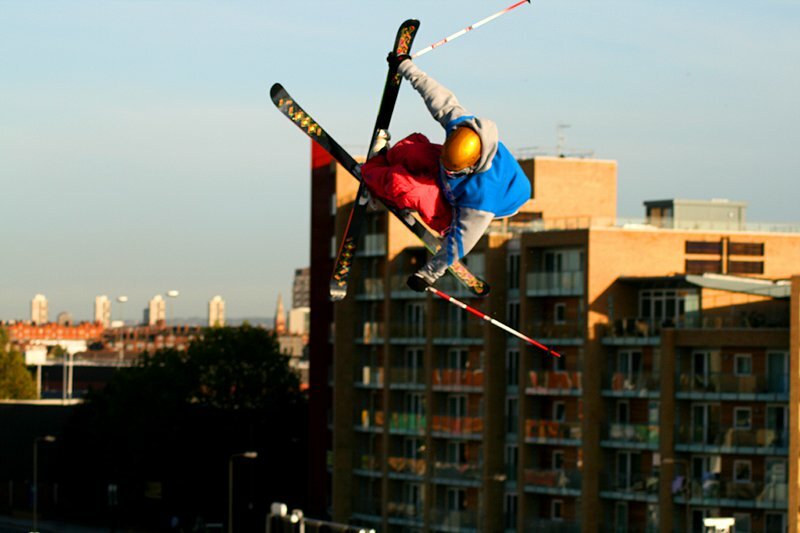 Thursday evening saw skiers and boarders test the speed, getting used to the wind and finding out why London&rsquo;s inclement weather (57 degrees and raining all the time) is not perfect for skiing. 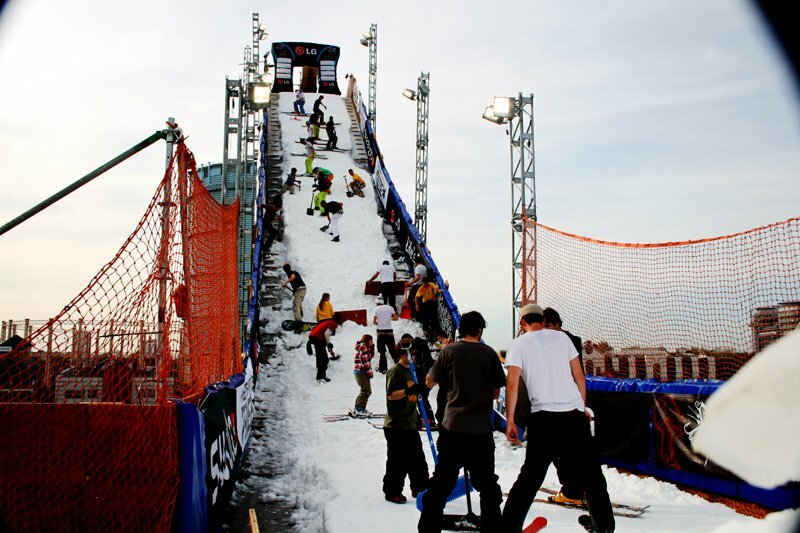 Tanner Hall, who judged the big air event, began shaping the jump and getting the riders hyped up. As the first straight airs were thrown it was obvious that wind was beginning to be an issue, but the riders still stepped up to the mark and began spinning 7&rsquo;s and even a misty 10 from Dumont, live on British news! 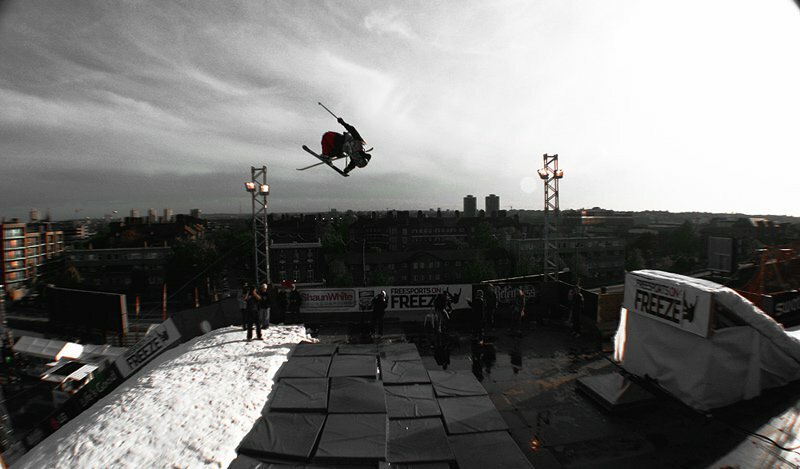 The jump took the first day session well but on Friday morning, the day of the international ski big air, there was no snow left on the ramp&hellip;all 250 tonnes had melted! The diggers and shapers took to the jump as soon as the rain stopped at 6am and began to get it ready for competition. 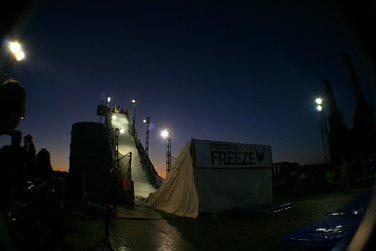 I helped out but even with almost 40 people working on it, it still took almost 6 hours to get it looking like a ski jump. The riders were (almost all) patient and qualifications were pushed back until 3:00 with only 40 minutes of practice. 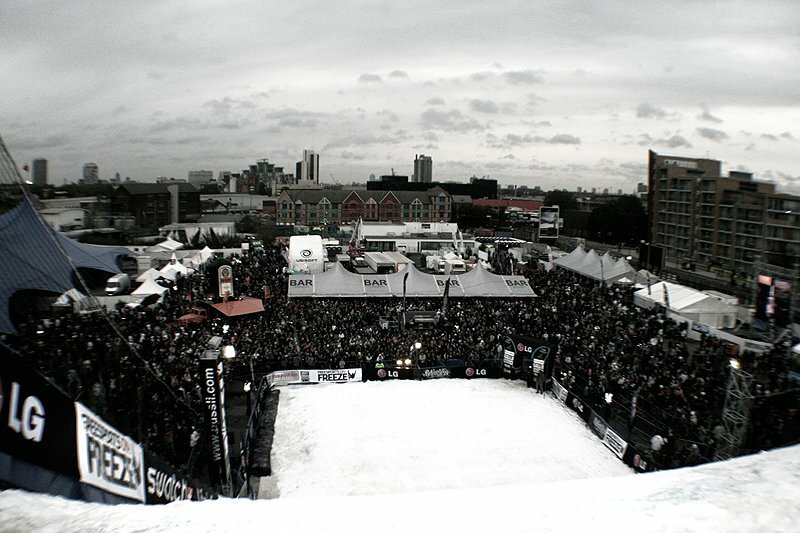 When the jump was ready riders began hitting it with most riders throwing straight airs to start with. As practice continued the sun came out and soon switch, corked and unnatural spins were being thrown with some notably insane grabs from Fabio Studer and Pekka Hyysalo, while English gentleman James &lsquo;Woodsy&rsquo; Wood hit up the first double of the day with a stomped double lincoln. 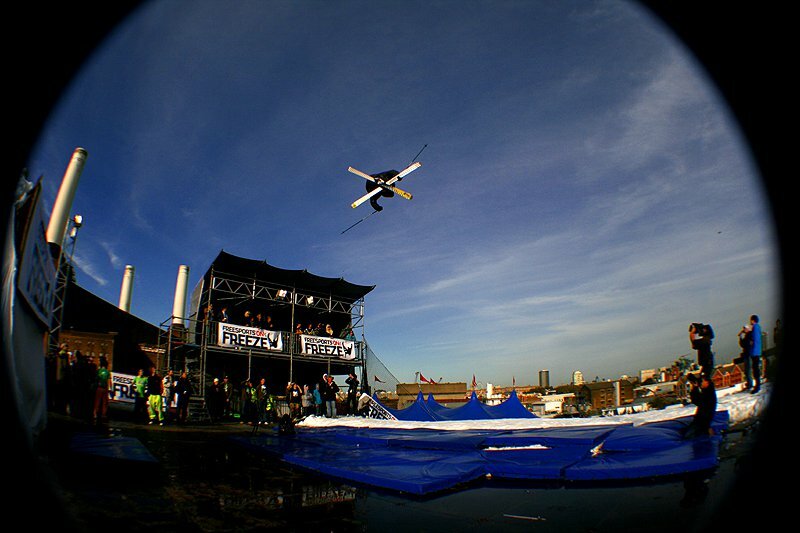 Soon it was time for the first round of qualifications; Patrick Hollaus kicked off the proceedings by setting the standard high with a 900 true tail, and the growing crowd began to realise what they were in for. The noise grew and Roy Kittler stepped up and threw a switch 7 double true tail. Ben Mayer decided to go for the big crowd pleaser and came down the ramp fast and hard stomping his switch misty 9 tail. 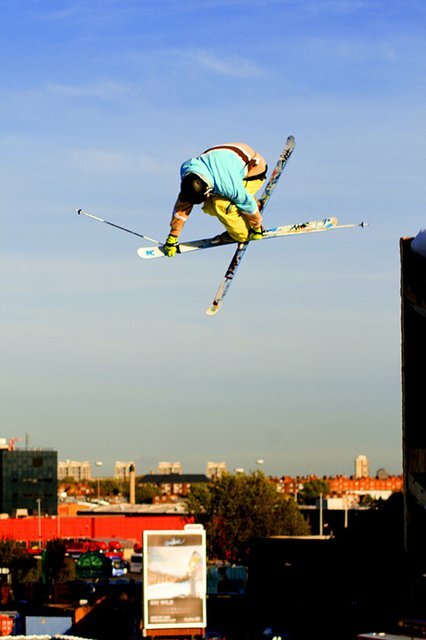 The first qualification double came seconds later as PK Hunder hit the ramp with a double cork ten mute to nose. 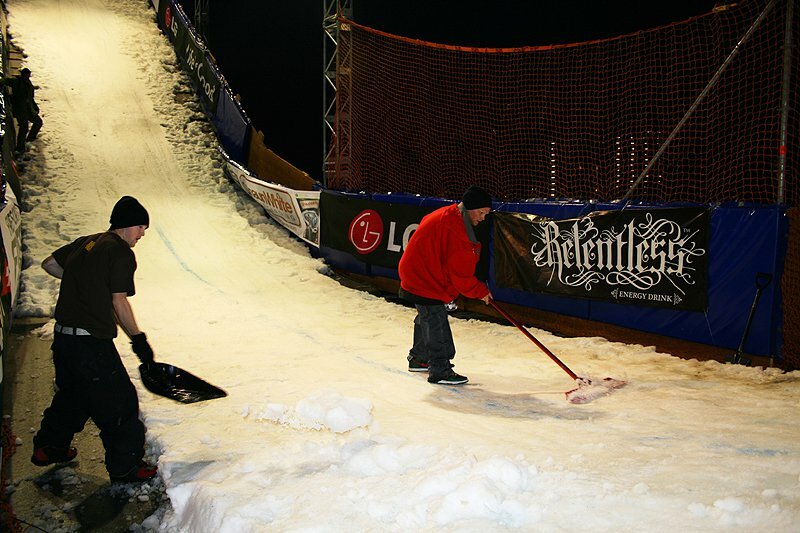 In the second run of qualification 1 many riders threw 10&rsquo;s including a stylish switch 10 tail from Richie Permin. 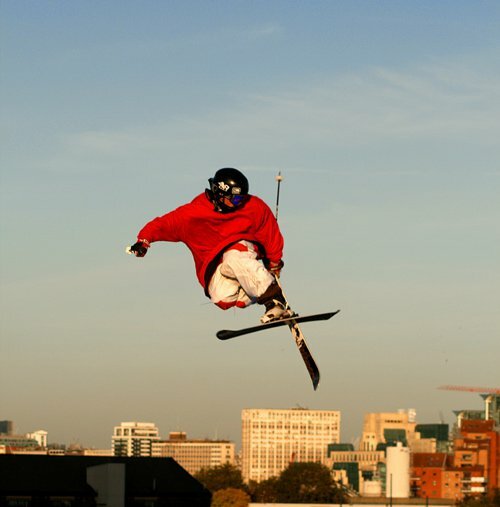 Marec Doniec, dressed in wonderfully garish 09 purple Oakley threads, threw a rodeo 9. PK threw another even more stylish double cork 10. The jump was quickly shaped by the persevering digging crew, some of which had been there since 6am shaping it up without a break. 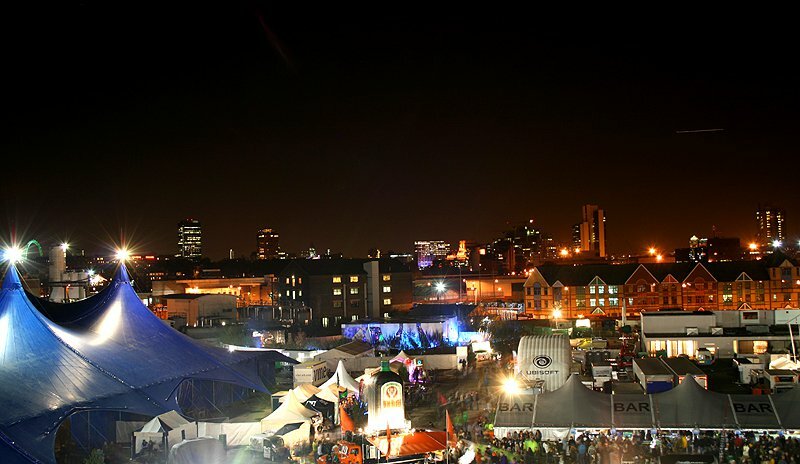 Subsequently the second round of qualifications was ready to start. Szczepan Karpiel started the second round with a super stylish switch 5 under mute which was quickly followed by the most stylish rider there, Fabio Studer, with a massive 720 truck driver with poke. Henrik Harlaut, the youngster from Sweden, in the words of the announcer &lsquo;went to the store and they had run out of shirt size medium&rsquo;, but nevertheless proceeded to spin a sweet cab 9, closely followed by Matt Walker with a bio 9 mute. Colby West laid down a crowd pleasing switch 7 misty tail, then Jacob Wester dropped in and one absolutely huge switch 10 tail later the crowd went wild with excitement as all 1.7 million scaffolding parts on the jump shook. Onto the second run in the second round of qualifiers, where Englishman Woodsy threw an incredibly stomped double lincoln loop to send the English crowd in spasms of excitement. 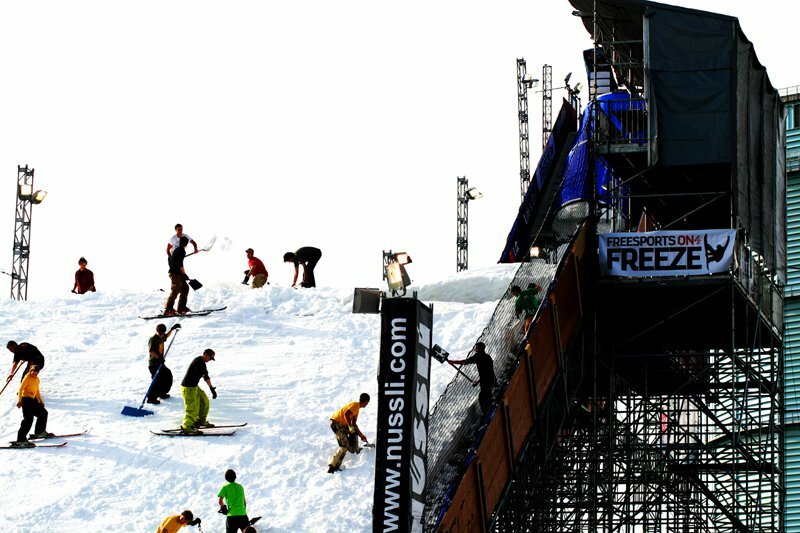 The other notable jumps in this round were the left 9 mute to Japan from Henrik and a steezy 10 tail from Jacob Wester. 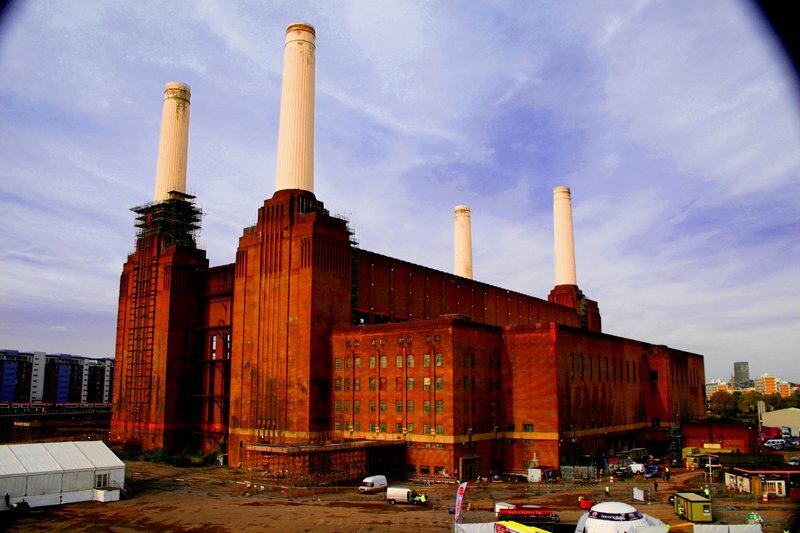 Well that is all from here in London. The Battle of Britain was cancelled due to no snow being left for the kicker on the last day (I suggest moving it north to Newcastle where it never gets above 30 degrees Fahrenheit). Massive thanks to Skye from Line Europe for the notes on the jumps and Nicko, Mark, Hickman, George and the rest for shaping the jump.